Step back a minute and consider a more familiar experience: what happens when you toss a ball straight up into the air? It gradually slows down as gravity tugs on it, finally stopping in mid-air and falling back to the ground. 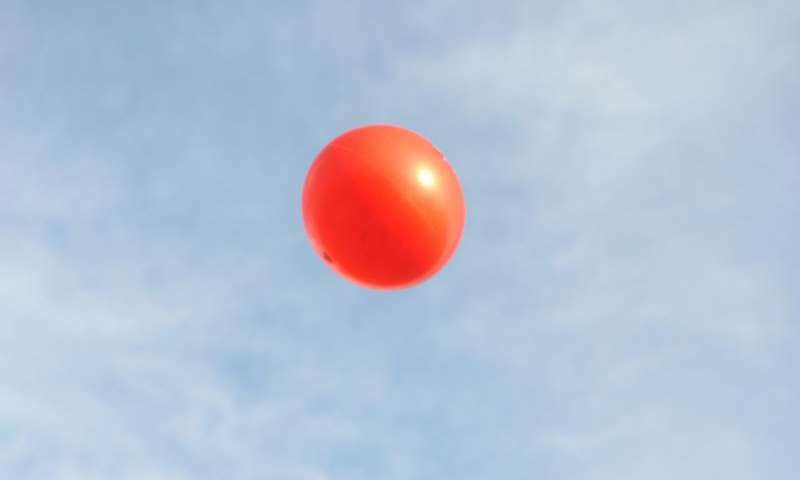 Of course, if you threw the ball hard enough (about 25,000 miles per hour) it would actually escape from the Earth entirely and shoot into space, never to return. But even in that case, gravity would continue to pull feebly on the ball, slowing its speed as it escaped the clutches of the Earth. But now imagine something completely different. Suppose that you tossed a ball into the air, and instead of being attracted back to the ground, the ball was repelled by the Earth and blasted faster and faster into the sky. This would be an astonishing event, but it's exactly what astronomers have observed happening to the entire universe! Scientists have known for almost a century that the universe is expanding, with all of the galaxies flying apart from each other. And until recently, scientists believed that there were only two possible options for the universe in the future. It could expand forever (like the ball that you tossed upward at 25,000 miles an hour), but with the expansion slowing down as gravity pulled all of the galaxies toward each other. Or gravity might win out in the end and bring the expansion of the universe to a halt, finally collapsing it back down in a "big crunch," just like your ball plunging back to the ground. What goes up must come down… right? Credit: www.shutterstock.com. So imagine scientists' surprise when two different teams of astronomers discovered, back in 1998, that neither of these behaviors was correct. These astronomers were measuring how fast the universe was expanding when it was much younger than today. But how could they do this without building a time machine? Luckily, a telescope is a time machine. When you look up at the stars at night, you aren't seeing what they look like today – you're seeing light that left the stars a long time ago – often many hundreds of years. By looking at distant supernovae, which are tremendously bright exploding stars, astronomers can look back hundreds of millions of years. They can then measure the expansion rate back then by comparing the distance to these far-off supernovae with the speed at which they are flying away from us. And by comparing how fast the universe was expanding hundreds of millions of years ago to its rate of expansion today, these astronomers discovered that the expansion is actually speeding up instead of slowing down as everyone had expected. Instead of pulling the galaxies in the universe together, gravity seems to be driving them apart. But how can gravity be repulsive, when our everyday experience shows that it's attractive? Einstein's theory of gravity in fact predicts that gravity can repel as well as attract, but only under very special circumstances. Repulsive gravity requires a new form of energy, dubbed "dark energy," with very weird properties. Unlike ordinary matter, dark energy has negative pressure, and it's this negative pressure that makes gravity repulsive. (For ordinary matter, gravity is always attractive). 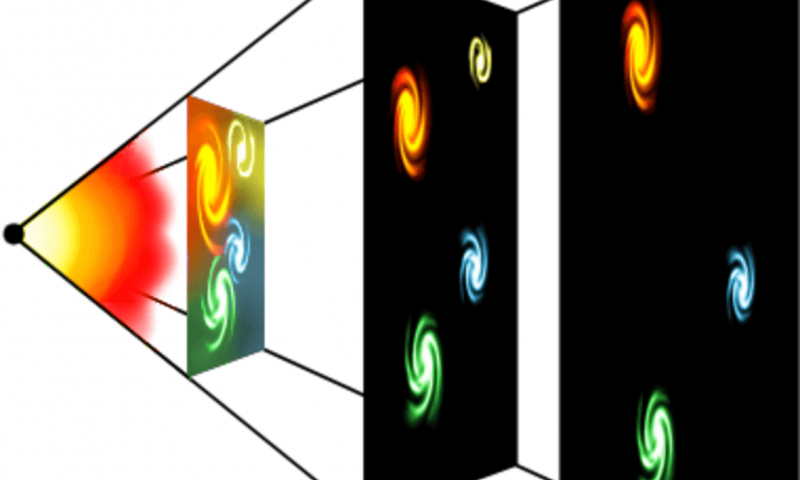 Dark energy appears to be smoothly smeared out through the entire universe, and it interacts with ordinary matter only through the action of gravity, making it nearly impossible to test in the laboratory. The simplest form of dark energy goes by two different names: a cosmological constant or vacuum energy. Vacuum energy has another strange property. Imagine a box that expands as the universe expands. The amount of matter in the box stays the same as the box expands, but the volume of the box goes up, so the density of matter in the box goes down. In fact, the density of everything goes down as the universe expands. Except for vacuum energy - its density stays exactly the same. (Yes, that's as bizarre as it sounds. It's like stretching a string of taffy and discovering that it never gets any thinner). Since dark energy can't be isolated or probed in the laboratory, how can we hope to understand exactly what it's made of? Different theories for dark energy predict small differences in the way that the expansion of the universe changes with time, so our best hope of probing dark energy seems to come from ever more accurate measurements of the acceleration of the universe, building on that first discovery 17 years ago. Different groups of scientists are currently undertaking a wide range of these measurements. 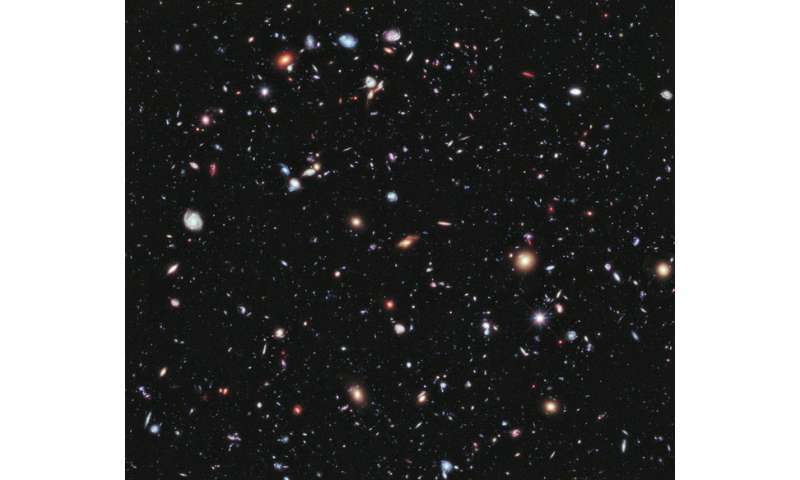 For example, the Dark Energy Survey is mapping out the distribution of galaxies in the universe to help resolve this puzzle. There is one other possibility: maybe scientists have been barking up the wrong tree. Maybe there is no dark energy, and our measurements actually mean that Einstein's theory of gravity is wrong and needs to be fixed. This would be a daunting undertaking, since Einstein's theory works exceptionally well when we test it in the solar system. (Let's face it, Einstein really knew what he was doing). So far, no one has produced a convincing improvement on Einstein's theory that predicts the correct expansion for the universe and yet agrees with Einstein's theory inside the solar system. I'll leave that as a homework problem for the reader. Scientists used to think that the expansion of the universe was described by the yellow, green, or blue curves. But surprise, it’s actually the red curve instead. It's evil, from the 8th dimension growing everywhere in the universe. Like the dark side of the force, trying to disperse the universe into chaos and nothingness. The only way to save ourselves is good thoughts, prayer and generally being nice guys then we can banish the darkness and draw back together the far flung galaxies into the center of the universe where the shining singularity of GOD will be REBORN in everlasting GLORY........ or not. No doubt Einstein's general relativity will one day have a modification made to it if only to unify it with Quantum mechanics, as Newton's theory of gravity was made more accurate by General relativity in extreme conditions. I'm jealous of the future people who will get to find out eventually, when I'll more than likely be pushing up the daisies. This is an idea I have been playing about with, well...maybe not just an idea. I mused, what continually moves along yet stays the same (density in the article) and it does this in all directions. Would a dimension of Time fit that? That is an actual entity not just progressive change or calendar time. In that sense Time would being stretching things out regardless of gravity and since the Time/radius/volume is increasing wouldn't that mean that existing would have to move faster to fill the ever increasing Time Volume. Actually, I have been working on a 4D Time (1D as the 'arrow of time' and a manifestation of the other 3). However, I confess, the math has worked out yet so I can't make any claims or predictions and it does really remain an idea. I guess someone will suggest I discontinue with the idea..? I'd sure feel better about this 'Dark Energy' explanation if Special Relativity's reciprocal time dilation - the reason time dilation isn't adjusted in red shift observations - had any experimental evidence for it whatsoever. There is evidence for time dilation; there is evidence for GR's directional time dilation. But no experiments have yet shown that time dilation can be reciprocal. If that's wrong, then our cosmology needs a major rework, and the Dark Energy explanation is no longer needed. I once had some halfwit prof tell we physics students that gravity was an inherent property of matter. Well then the same crackpot reasoning can be reversed to say that antigravity is an inherent property of space. The more space, the more 'anti-gravity'. What it may eventually come down to is that someday a curious group with a lot of very expensive and more modern than our own equipment will peer down to almost Planck Scale and find a preon or maybe a proto-preon that is the force carrier for both forces.. And in truth they may be only one particle, call it positive-gravi-preon; and the other, call that negative-gravi-preon. Or ... all those people were correct that said that space was expanding equally everywhere. It stands to reason that if this were true the universe would expand at an ever increasing rate. I point this out as a simple result of the expansion statement as inevitable. Yes gravity attracts and space expands are unrelated phenomena. I do not state that I know space expands but it has been claimed to be true for the last 70 odd years and I know no reason as yet to dispute it. It is just that as you get more space you will automatically get more expansion without applying any other trick to it. This should be dampened a little by gravity but the net effect should be accelerating expansion. If that is called vacuum energy then so be it. Dark energy and matter exist only in the imagination of modern shamans. Just because the universe is not expanding and there is no reason for dark energy to springing from nowhere or from another imaginary pseudo physical phenomenon as additional invisible dimensions. Such ideas can find a place in some occult sect, but not in a scientific institute. "So far, no one has produced a convincing improvement on Einstein's theory that predicts the correct expansion for the universe and yet agrees with Einstein's theory inside the solar system. I'll leave that as a homework problem for the reader." The gravitational force can never become repulsive and the density of scalar vacuum energy will always remain constant irrespective of (and non-contributory to) the expansion of the universe. why would you have time dilation in a red shift equation? you are measuring light -- light travels at c -- thus it does not experience time. I believe you were looking for a logical contrapositive. so i will give the physics professor the benefit and say he was correct and had a lot of crackpot students that never learned to study mathematics. Technically correct due to the photons lack of ability to perceive time the way we do...not because it travels at c.
I disagree - the time dilation equations are asymptotic in nature - but at velocity c - time does not exist. If you traveled at c between two points you would not experience time in the interim..
if you observed this movement for 1 yr the traveler will have crossed .9999999999999 light years --- and only 1 sec will have passed inside the frame of the traveler. if we get even closer to c we can say get to a point where the traveler experieces 1 plank second per light year due to time dilation in the observational frame. as you get even closer to c it get even better -- at c you can cross the entire universe in NO TIME to the traveler. But infinity to the observer. At c time does not exist. I don't claim to know more than people who are actually doing the math and experiments but I have questions to pose and I hope someone can give me some insight. 1. what if in the future we find that the increasing velocity at which the universe is expanding does eventually slow or even start to contract? would we assume that there was a finite amount of dark energy and that the universe simply "ran out of fuel"? 2. if hawking radiation states that as radiation is emitted from a black hole then the mass of the black hole decreases and subsequently the energy does as well, does the strength of the gravitational attraction remain the same, or shrink? (as light can still not escape the event horizon even at a decreasing rate of area) if so, would the space time effected by the black hole be warped at an increasing rate? because of the consistent strength of gravitational attraction compared to the decreasing area of space-time? El Nose, if time dilation is directional, then light from the distant past emitted from objects moving away from us is shifted by time dilation. Edward Kipreos at U Georgia authored a highly controversial paper on this a few months ago. Most physicists seem to be ignoring him - though the tone he struck was quite reasonable, I thought. He didn't insist that SR is wrong, he merely pointed out that its reciprocal time dilation hasn't been experimentally verified, and that if it's wrong, we *should* be adjusting red shifts to compensate for directional time dilation, with huge consequences for cosmology. Kipreos points out that no experiments have demonstrated that reciprocal time dilation is even a thing. It's a big damn unverified hole in SR. Wacky? Maybe, but absent experimental evidence for reciprocal time dilation, it would be nice to get some. 1. what if in the future we find that the increasing velocity at which the universe is expanding does eventually slow or even start to contract would we assume that there was a finite amount of dark energy and that the universe simply "ran out of fuel"? The source of energy is "transformed mass". If all the mass in the universe were transformed to energy without re-transformation back to mass, all the planets & stars would cease to exist. 2.hawking radiation states that as radiation is emitted from a black hole then the mass of the black hole decreases and subsequently the energy does as well, does the strength of the gravitational attraction remain the same, or shrink? It shrinks due to less mass present because some of it has been transformed to energy & spun off beyond the bounds of the BH. Dark energy and matter exist only in the imagination of modern shamans. Can you then tell me what is causing the deviation in our measurements? Please refrain from citing the bible or your god or your religion or that you just know it must be wrong. or from another imaginary pseudo physical phenomenon as additional invisible dimensions]Such ideas can find a place in some occult sect, but not in a scientific institute. You are the biggest hypocrite I have ever met. What place do you think religion and god and a creator have in science and scientific institutions? In fact, the Perlmutter "experiment" that supposedly found the universe to be accelerating, as described, was flawed. They found the red shift of a galaxy, then used the Hubble Constant to find it was five billion light yeas away. But, then, a Type Ia supernova there was dimmer than expected for the distance, and, from that, they "concluded" that that galaxy must be more the five billion light years away. But, then, how could it get so far away if it was going at the slower speed of the Hubble Constant? It turns out that it is reported that Type Ia supernovae are not all the same, and some can be significantly dimmer than others. But this means that, if the universe were accelerating, even nearby galaxies would be further away than the Hubble Constant indicates. So the Hubble Constant could not be constant. But it is declared constant out to at least two billion light years. 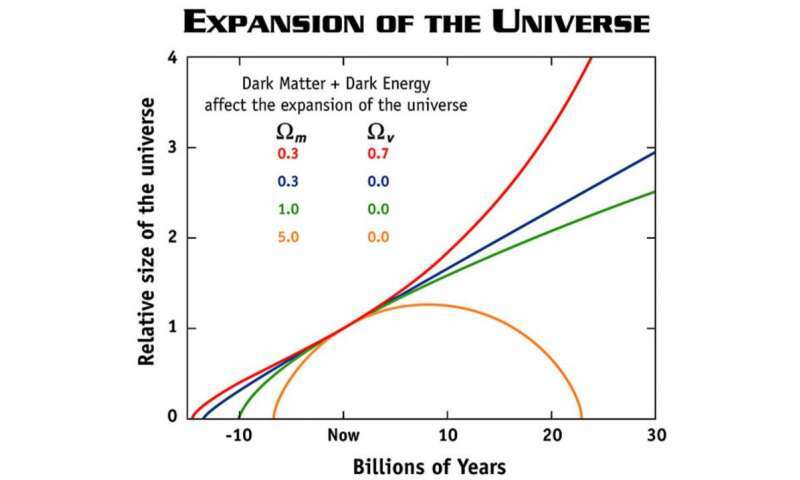 Is the Universe in expansion phase? Most of the energy of the Universe eventually will be converted to light (photons). The dark energy in the form of gravitational force created by photons at the edge of the Universe (at the event horizon of the universe).